﻿The following instructions are designed to assist you in completing the online application to our EMBA or IMM Global EMBA programs. We recommend printing or keeping the instructions visible while you complete the application. Do not forget to save your password in case you need to work on the application in multiple sessions, or need to adjust an answer before submitting. It will be helpful if you have the following on hand when completing the application: resume (so you can see your employment dates and also upload the resume into the application); credit card for the application fee, which comes at the end of the application, and your essays (you can write the essays in a Word document and later upload them into the application spaces provided). Our application requires three essays: (1) A Statement of Purpose, (2) a Cohort Approach Essay, and (3) a Leadership Philosophy Essay. Step 3: Register for an account by providing your email address, first and last names and birth date. Once you have received your temporary pin, login in and change your password. Step 6: Complete the Personal Background Information. Step 7: Complete the Emergency Contact Information. Step 8: Complete the Residency Information. When you reach the question regarding in-state tuition, please answer “no, I do not qualify for in-state tuition.” You will not be charged out-of-state tuition, as it is not required by our programs. However, if you answer "yes" to the question, you are led to other questions irrelevant to you. Step 9: Complete the Campus and Program Information. Complete the entire section and select West Lafayette (main campus) as the campus you will attend. For the proposed graduate major, please select Management (Executive MBA) from the drop-down menu. Step 10: Complete the Program Details Information. Select an area of interest from the dropdown, either the EMBA or the IMM Global EMBA. Select Master of Business Administration as the Degree Objective. Please select fall 2018 for the EMBA program or spring 2020 for the IMM program. Additional Contributions: You may complete this optional essay if you feel there is something additional you would like us to know. Scholarship Application Process: Complete this optional essay to be considered for a scholarship. You MUST complete this essay for scholarship consideration. Step 12: Complete the Education Background Section: Upload a copy of official transcripts for all universities attended. If you attended an international institution, and the transcripts are in a language other than English, please upload a copy of an official English translation. If a social security number is written on the transcripts PLEASE BLACK IT OUT with a pen or marker before uploading it. If you cannot find your university in the school code list, please type your institution name and type 000000 in the CEEB field. Please note that official transcripts and English translations (if applicable) must still be sent to Nancy Smigiel at nks@purdue.edu, even though you have uploaded copies into the application. There is no need to write non-degree courses you have taken. Step 13: Complete the Additional Information Section. You may skip the faculty portion of the application. The faculty will be selected for you in our program. You may also skip the graduate assistantship and fellowship portion of the application. We do not provide assistantships or fellowships. There is no targeted recruitment program, so your answer will be no. Indicate how you heard about our program. This is of great value to us. List any teaching certifications and publications. Step 14: Complete the Employment Section. Please list your employment beginning with your most recent employer and continue in a descending order. Please list all employment since your baccalaureate was earned. If you worked full-time, professionally, prior to earning your bachelor’s, please list that experience as well. Step 15: Write the Statement of Purpose Essay and upload it into the application. Step 16: Test Scores Section: If you have taken the GMAT or GRE and would like to provide your scores, you may do so. If you have not taken the GMAT or GRE, leave this portion blank. These tests are typically not required for our programs. Step 17: You may skip the Diversity Essay. Step 18: Upload your resume. Step 19: Complete the Recommendation Provider List. We require two professional recommendations, one of which should be from your immediate supervisor, if possible. Step 20: Complete the entire Acknowledgements section of the application. Step 21: Type your full legal name in lieu of a signature. Step 22: Review the application. Any section skipped will be revealed. Step 23: Once you have completed all missing sections, submit your application and then pay the application fee by credit card. The fee is $60 for U.S. applicants; $75 for international applicants. It takes 24 hours for the application to move into our database. We will contact you via email once we have received the application and the admissions committee has determined whether to move the application forward through the admissions process. Thank you for your interest in our executive MBA programs! Need assistance? Contact Associate Director of Admissions Nancy Smigiel at 765-494-4580 or nks@purdue.edu with questions about the application process. 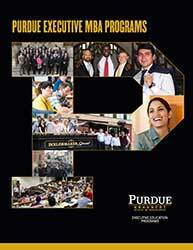 Download our brochure and start your journey to earning an Executive MBA from Purdue University. Take advantage of our Personalized Engagement Package, designed to help you make the best EMBA program decision.